The first use of paper ballots to conduct an election appears to have been in Rome in 139 BC. In Ancient India, around 920 AD, in Tamil Nadu, Palm leaves were used for village assembly elections. The palm leaves with candidate names, will be put inside a mud pot, for counting. This was called Kudavolai system. The United States, a Republic, has a unique politics of long and short ballot. Before the Civil War, many believed governmental effectiveness was enhanced by increasing the number of elective offices to include such comparatively minor posts as the state-level secretary of state, county surveyor, register of deeds, county coroner, and city clerk. A larger number of elected offices required longer ballots, and at times the long ballot has been suggested to have resulted in donkey voting and confusion, though the seriousness of either problem can be disputed. Progressivists attacked the long ballot during the Progressive Era (circa 1893–1917). 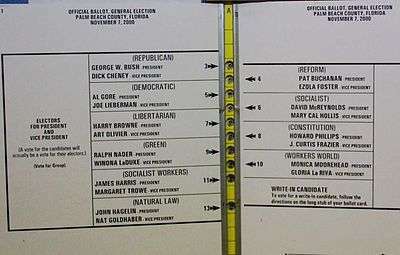 Perspective view of the infamous 2000 Palm Beach County, Florida "butterfly ballot". Some political scientists prefer more explicit statements of the voter's actual tolerances and preferences, and believe that failure to reflect these in ballot design and voting system alternatives causes many problems and leads to calls for electoral reform. For instance, a non-binding referendum or poll, carried out on a ballot, carries much more weight than one carried out with only a public sampling in a less politically committed event than an election. For example, one might count the number of ballots whereon the voter had crossed out the name of the political party that nominated the candidate, even if (maybe only if) that voter had voted for him or her. This would indicate support for candidates but would be able to send signals to them that the "party line" was not why that voter voted for them, but rather, she or he expected them to act independently. Such marking and counting could be carried out on an ordinary ballot with no provision for it, however, there would be risk of counting it as "spoiled" if the marks were unclear, and if ballot design had not allowed for it initially. In a jurisdiction using a paper system, voters choose by marking a ballot or, as in the case of Israel and France, picking one pre-marked ballot from among many. In most jurisdictions the ballots are pre-printed with names of candidates and the text of the referenda. The Philippines (until 2007) and Japan are an exception. There, voters must write the names of their candidates on the ballot. Election officials manually count the ballots after the polls close and may be recounted in the event of a dispute. In a jurisdiction using a punched card system, voters choose by removing or "punching out" a perforated chad from the ballot next each choice, sometimes with tools as simple as a pin, but usually with a ballot marking device such as the Votomatic. The ballot may be pre-printed with candidates and referenda, or may be a generic ballot placed under a printed list of candidates and referenda. Tabulating machines count ballots after the polls close. 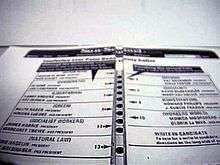 Officials may manually count the ballots in the event of a dispute. Punched card voting systems are being replaced by other voting systems because of a high rate of inaccuracy related to the incomplete removal of the perforated chad and the inaccessibility to voters with disabilities. In a jurisdiction using a mechanical voting system, often called a "voting machine", voters choose by pulling a lever next to their choice. There is a printed list of candidates, parties and referenda next to the levers indicating which lever is assigned to which choice. When the voter pulls a lever, it turns a connected gear in the machine, which turns a counter wheel. Each counter wheel shows a number, which is the number of votes cast using that lever. After the polls close, election officials check the wheels' positions and record the totals. No physical ballot is used in this system, except when the voter chooses to write-in a candidate. Other systems are replacing mechanical voting systems because they are inaccessible to disabled voters, do not have a physical ballot and are getting old. In a jurisdiction using an electronic direct record voting system (DRE), voters choose by pushing a button next to a printed list of candidates and referenda, or by touching the candidate or referenda box on a touchscreen interface. As the voter makes a selection, the DRE creates an electronic ballot stored by in the memory components of the system. After the polls close, the system counts the votes and reports the totals to the election officials. Many DREs include a communication device to transmit vote totals to a central tabulator. The touchscreen systems remind people of an automated teller machine (ATM) and often are described as such. Smith, Sydney (1839). Ballot. London: Longman, Orme, Brown, Green and Longmans. ↑ "Ballot". Merriam-Webster. Retrieved 2012-11-07. ↑ "Ballot". Merriam-Webster Learner’s Dictionary. Retrieved 2012-11-07. ↑ "Ballot". Online Etymology Dictionary. Retrieved 2012-11-07. ↑ "Panchayat Raj, Policy notes 2011-2012" (PDF). Rural development & panchayat raj department, TN Government, India. Retrieved 3 November 2011. ↑ "Heritage in a park". The Hindu. Chennai, India. 2 April 2010. ↑ "Handbook on Kongu archaeological treasures". The Hindu. Coimbatore, India. 27 June 2005. ↑ Jones, Douglas W.. A Brief Illustrated History of Voting. University of Iowa Department of Computer Science. ↑ Associated Press (2003-07-14). "State: Ballot display revives chads, chaos of bungled election". Saint Petersburg Times Online Tampa Bay. Retrieved 2014-10-26. ↑ "Statement of Commissioner Victoria Wilson". Voting Irregularities in Florida During the 2000 Presidential Election, www.usccr.gov. Archived from the original on July 21, 2011. Retrieved 2014-10-26. ↑ Bonser Method. Retrieved 2016-10-06. Look up ballot in Wiktionary, the free dictionary. Wikimedia Commons has media related to Ballot papers. "Ballot". Encyclopædia Britannica (11th ed.). 1911.